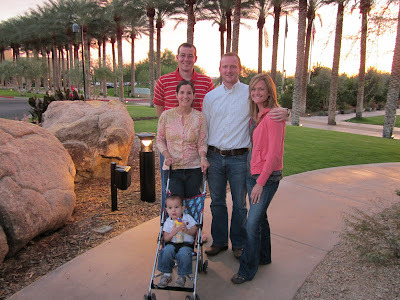 Tomorrow I'll be posting a review of the Marriott's Canyon Villas property in Phoenix, Arizona. So I've been spending some time reflecting on our trip (you can read a full report here). One of the highlights was spending some quality time with my brother-in-law and his then-girlfriend. I say "then" because she became his fiance this weekend, and we couldn't be happier about that. They live in Iowa and we don't get to see them as much as we'd like, but we're thrilled to be gaining a sister and aunt! This Monday I'm dreaming of more adventures with the two beautiful people you see standing with us in the picture above. It's always nice to find travel companions that don't seem to mind (or at least pretend not to) when your son wakes them up at 4 a.m. demanding breakfast. Sorry! I think I wrote brother, but, of course, b-i-l is what I meant! I LOVE the new look and the logo is fantastic!! It is perfect for you and your mission! Love the new look! Great Monday dream - there's nothing better than spending time with family.